This retreat is meant for teenagers, in order to build-up a morally enriched life, with commitment to the Christ and society. 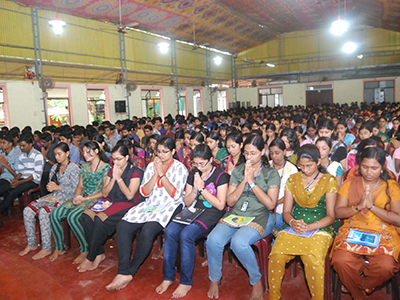 Besides, this retreat helps students to attain self-confidence and enthusiasm in their studies. Students under the age group between 9-18 could attend this retreat. Here we also highlight how to live in purity and to live with dignity in human life, with the aid of sacramental ceremonies and Holy Masses. Classes by various resourceful personalities and spiritual services by the priests constitute the major part of these retreats. 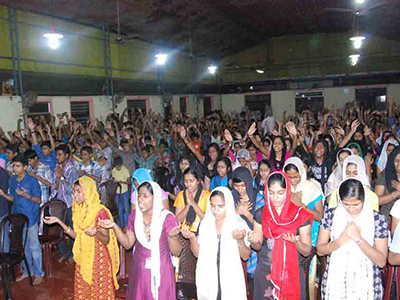 In Christeen Retreat (English) the retreat for teens will be in English and for parents in Malayalam. Every family resembles the Holy Family. In this way, all of us are required to lead a life pleasing to each other to fulfill the desire and motto of our Saviour, Jesus Christ. For this, a better understanding and warm relationship among the family members are essential. In order to boost the role and responsibility of each member of a family, be it the father or the son, a common forum would be a desideratum, which can provide enough opportunities to share and hear the sorrows, stress and opinions of all members of the family. Moreover, this would help to bridge the gap between parent-child, husband-wife relationships, if there are any. This is the motive behind family retreat. Br. Santhosh Thomas is the chief programme co-ordinator of Christeen Family retreats. This is a new retreat introduced by Christeen. This retreat is meant for kids below 8 years. Parents attend this retreat with their children. Basic lessons on God’s love, Christ as our Saviour, the nature around us, role of parents and teachers etc. are beautifully and attractively presented before these little ones with the help of skits, musical entertainments, dances, action songs etc. 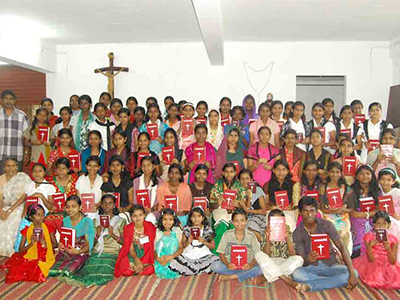 This helps them to get a basic understanding of God’s love and their ideal role in life. 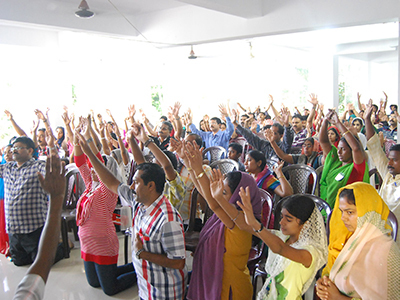 Victory retreat is exclusively meant for students in the 10th & 12th classes. It ensures and instills better confidence in them to face their first public examination with courage, pleasure and hope. It is painfully observed that a lot of suicidal attempts are reported, especially in Kerala among 10th Standard students. After the retreat, the students get the confidence that Jesus the greatest teacher is with them during the exam. It also helps them to study systematically for the preparation of their exams, to keep good manners, to respect their parents, teachers and elders thus growing dear to God and people. As part of our mission, we have been focusing children who are thrown out from the society, like the orphans, children from the slums, children of prisoner’s etc. Our past experience reveals that if we support and provide ample training and guidance, these segregated children would certainly realize that there is someone to care for them and most importantly about a God who is always there as a shelter for them and that He is their loving Father. With this view, we have been conducting a special retreat called ‘KRIPA SANGAMAM’, for these hapless children for the last few years, each of which lasts for 4 – 5 days. As the participants are from poor backgrounds, Kripa Sangamam is conducted free of charge, though we incur nearly Rs. 500/- per participant towards accommodation, food, hand outs etc. Each year we conduct 3 – 4 'Kripa Sangamam' retreats, attended by an average of 300 children per programme. This is arranged when there are no retreat programs for children, at the centre. This retreat will help the elders to overcome the stress and strain of daily life, through trainings to lead a spiritual life thereby upholding moral values and to do good to the society, at large.